I took a favorite life long recipe to our friend's house today. We have been enjoying this pound cake for years. My mom has been making this as long as I can remember. I cannot tell you how wonderful this cake is. My favorite is the very top 1/2 inch of the cake - the buttery, yummy layer. I always save this part for last. Combine margarine, butter, cream cheese and sugar and mix til blended. Add salt and vanilla. Add eggs one at a time beating after each egg. Add flour and mix well. Pour into a greased and floured 9" tube pan. Put into a non preheated oven and bake at 275 for about 1 1/2 hours. 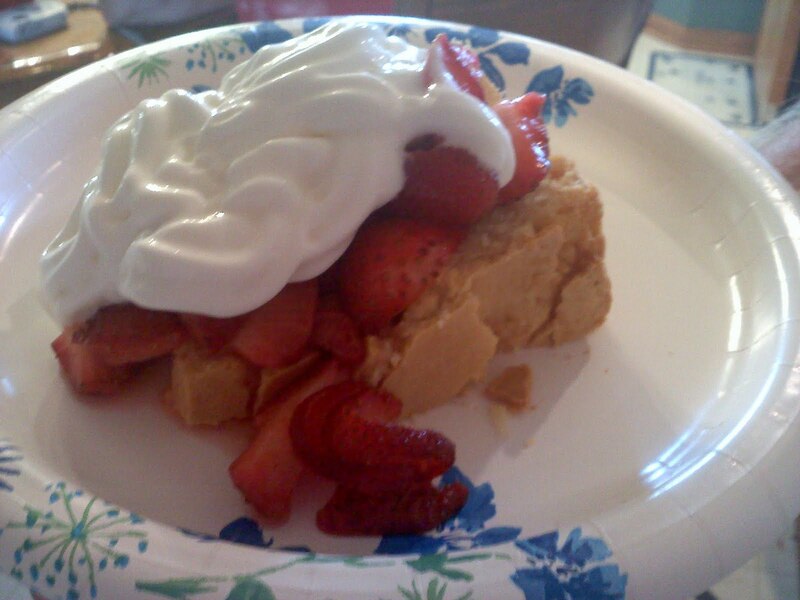 I served it today with strawberries and whipped cream. I especially love it with my great grandmother's recipe for warm vanilla sauce - Mooney's Warm Vanilla Sauce. Gonna make this tonight. Thanks for posting. Love that you are in Texas just like me!